This is really a wonderful Illusion, originally invented by some English guy I think. This little dragon is made out of paper – simply print it, cut it out, stick it together, and stand it on a table or shelf. When you move around, the dragon’s head seems to follow you around the room (if you stare at it’s eyes). Have a look at the video below to see what I mean. The effect is frightening! You can print the dragon yourself by following thumbnails below (be shure to fold dragon’s head to outside, and not the presumed inside fold!) This is awesome! How does it work? If we move around when viewing a solid object, our brain knows how the object we are looking at should behave. However the dragon gives us the wrong clues, because we mis-interpret what its shape is. We assume that the nose of the dragon is pointing out towards us, but in fact the dragon’s head is concave. Below is the dragon illusion blueprint, click on the image to view it full size, save it and cut it as the instructions say! I made this one a while ago when someone blogged about it. I absolutely love it and have it at my computer now. Are there any others like it? That you can make – I’m still surfing your site now..
Really amazing, thank you for this blog and all the other illusions you’ve found, this one deserves a big oh but the others cool too, and some of them are astonishing and really unexpected! This illusion works with most (painted) sculpture or even images that shows someone staring right at the camera. dat wuz kool, yo! good job! ima print this ****!!! How do you print it? This illusion was actually “invented” by Jerry Andrus. He has spent a lifetime creating amazing optical effects. this illusion does not work!!! Hey, the image links are no good. Does someone have this mirrored somewhere else? I think user ‘tray’ up there missed the point of this illusion. For a demo look at the video linked in the introduction above. OMG!!! SICKEST THING IVE EVER SEEN!!! ITS ON MY COMPUTER TOP!!! I saw that on grand illusions a couple weeks ago, printed it out, followed the cutting and folding instructions, and it didn’t work…:( He’s on my computer desk right now, rather smashed, but he really didn’t work. Gr. I saw the video, printed it out, built it, and now I am fascinated. but after i’ve watched the video over and over, i saw my fault. The secret: the white side of the paper must be outside. when you look at it from downside, you have to see the dragon’s face. When you built it right, you have to close one eye, and move your head. after a few minutes, i feel griddy..
he saw a really cool effect? WTF? Spelt isn’t even a word! Yes it is, learn English please. i believe americans have a SPELLINGbee? ur excuse is that u r american. and why do we critisize spellin anyway? ever heard of slang? critisizin is a waste of time. Gee wilikers dandy the dragon is watchin me eyes and what not! brilliant spectacle yes? I wonder if youcould make this into a wallpaper, or screen saver. If you first took the 2D image and made a sterogram GIF file like the Shiva stereogram, then the image would follow you around from your computer screen. Or, would the 2D image be missing something? If the illusion does not work for you, insure that you constructed it with the dragon’s head inverted. That is, while the body sides fold back and is convex, the head folds forward and is glued concave. This will help you see the illusion. thats cool, i should try to make it. I agree with Steven. IT IS THE COOLEST ILLUSION EVER! too bad you have to say with one eye closed. I think I know why. You get 1 perspective from each eye, so you’re looking at it at two slightly different angles; say one person is standing behind the figure, one person is standing in front. The person standing in front’s brain thinks that the dragon is staring right at him, but the person standing behind the figure can tell that it’s a hollow face. in real life, it’s the same thing, only far less space between the two perspectives. GET IT?! Fascinating, repulsive, and unsettling all at the same time. Perhaps I say repulsive because of the unsettling factor. Either way, as soon as I get a color printer, I’ll have myself a blue dragon who watches my every move. Simply splendid. You’ve been looking at too many illusions. You don’t know how to spell. How do you print it? It keeps cutting off part of the tail and instructions or prints super small. i probaly has special gift, i saw the illusion with my two eyes open. I have a few questions….Mine doesn’t work. Do you have to watch it with one eye closed? Does it have to printed with a colour printed (I mean, does colour effect the illusion)? What was that fault you noticed? I may have made the same mistake. If i knew wat he was saying, I would have done it. please simplify that paragraph for a simple mind. Looks like he gona bite ya or something. when standing far away from it, i can see the illusion with both eyes. but up close i close one eye to see it. I got one watchin me now on top o my screen! *also you might have to get rid of some overlapping shadows by tilting the dragon up, down, left or right with coins, paper, pencils, etc. hahahahaha this was sooo awesome! That is amazing – I can’t believe it’s not more recognized, no-one seems to have heard of this! I absolutely love it! Are there any other colors I can make? Oh yeah… great illusion by the way! Very much like the concave portraits that appear to always be looking at you. Spelt IS a real word! It’s a grain, that when ground to flour consistency, makes wonderful “wheat free” bread. Find it in health food stores. what are you talking about?????? Spelt is past participle of spell!!! i just made my own…this is the coolest thing i have ever seen……..ever. I have seen a much larger dragon exactly like this at the Franklin Institute. It is a very cool illusion, and thanks for the picture so I can print it out. Right now I have one keeping watch right on top of my computer. AWESOME ILLUSION!!! Wow! thats so strange! i feel freaked out just thinking about it! thats so cool! Dragon, Dragon, Dragon, then you move and it goes ‘Swoosh!’and next thing you know its staring at you like its alive!… thats so hmmm… i don’t know how to describe it!!! 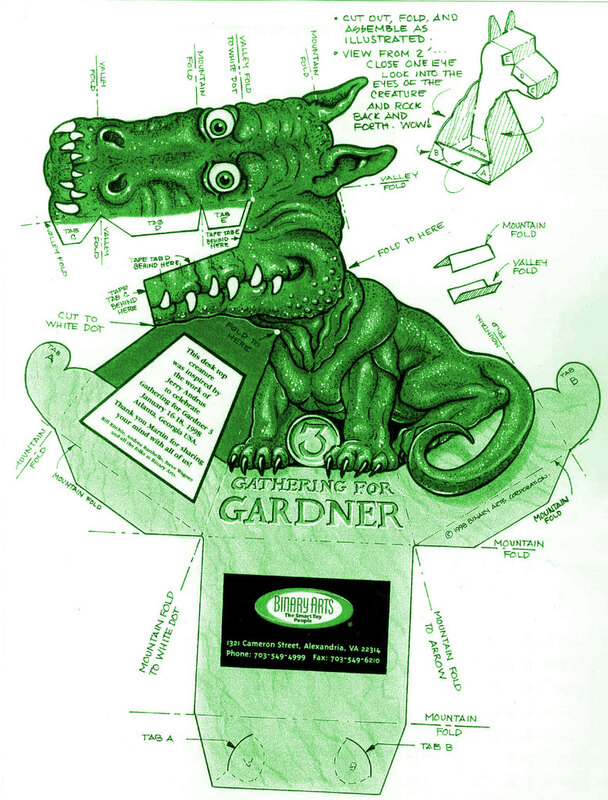 The illusion was created by Jerry Andrus for the 3rd “Gathering for Gardner”. It helps to illuminate the dragon’s head from below. the important thing to remember when you construct it, in the instructions, the “shaded” side is the blank side of the Paper cut out. You just screwed up my mind, no I’m able to watch it with both eyes open :S Not sure what I do to my eyes to make it work but I think I might be unfocusing them like you do on stereograms.. This is awesome. It seems so real. In my opinion the illusion does work with almost anything like photos or statues as long as the eyes are looking straight. But this illusion is cooler because it seems 3D. how do u do this??? I followed all the directions, its head is concave, it forms a pyramid…! *ahhhh* what did i do wrong?! I think a better question is, how does one get a “4.6” GPA when the scale only goes to 4.0? Okay, honor student here to redeem herself! I was sitting there looking at my piece-o-crap dragon when i closed an eye! and it wiggled its little head! then i moved it and closed my eye other eye…but then eveything went black, so i opened one of my eyes again…lol. This is awesome, it works so well! I’m a bit frustrated on the folding part of the head. Can someone please show a video on how to properly fold the head? Coz believe me, I’ve been working on this for 2 hours now and I’m going nowhere on the head part. Although reading some of the comments about it not working I am getting a bit discouraged. Very awesome. I had some trouble with the general construction, and it only seems to work at certain angles, but I found that if I placed it higher on my desk (corner type) the better it looked. I love this illusion. I might use it as an example for the kids in my daycare class. If you have trouble seeing it, step back and close one eye. Thny move to the left and right, It will jump right out at you. Relaxing your eyes is best to get the normal effect. I have one. It’s so cool! It does work! Hey, Alexandra, you’re a kid too? High-five! Or paw-five! I’m 11 years old! Alexandra and bunnygirl! im 9! and i love fred! LOL, I’m 12 and a half! I <3 Fred! Do you need glue to make this? If you have difficult to prove that it works, just pick you a video camera (phone, web cam, etc) and record a short clip. Remember, this only works at 2D! You must close an eye! I made it and it works, but nowhere near as good as the one in the video.. quite gay acctually but cool illusion.. But seriously Dont waste your time people.. you will be disapointed with the result no matter how well you make it..
HOW DO YOU MAKE THOSE?! REALLY cool. Couldn’t see the effect, so I thought that I made something wrong, but it really helps if you closes one of the eyes. I hope it gives Blow Jobs! If it doesn’t work, try looking at it with only one eye open. It does not work… there is this red x in a white box. same goes for many of the pics in this website. I tried right click show pic and stuff like that, but it still does not work. how do I make it show up? I can’t believe how rude some people are in their gripes about it not working. You’d think they’d paid $20. When first viewing it after assembly, i didn’t think it was working well at all. I had to squint and couldn’t get it in the right light. After a couple minutes of playing around with it, i’m amazed at how well it works, both horizontally and vertically. 2. Bright but difuse lighting. Lighting which is too harsh can create shadows which break the illusion. 3. On the dragon’s head and mouth, tape/glue the tabs as shown, but DON’T sharply fold the paper where unnecessary. Seeing creases doesn’t help. 4. Use thicker paper than the cheapest printer muck, but not too stiff. I used really cheapo paper, and it’s too easy to get in situations where light comes through from the rear. 5. When cutting along the edge behind which the tabs will be attached, CUT OFF THE BLACK OUTLINE so that the colors blend unbroken. At first i squinted a little bit and stared at his eyes, taking in the rest as peripheral. Once i could see his head as convex, i found that moving from side to side and up and down fairly quickly actually increased the ease of doing so. It wasn’t until that point that i noticed the bit about closing one eye, which just made the effect more dramatic. I may have to try my hand at designing my own critter. I printed out the red one, and it works great! Just like the previous poster pointed out though, try covering one eye and focus on the eyes and it really looks like it’s following you. Called reverse perspective. Theres a video abt the guy who made reverse perspective in a recent post abt 2/3 weeks ago. Sorry its 1 month go. Its called Video: Another Reverse Perspective. Go check it out i thinks its rather cool. Ha ha! This is so fun! I’ve made a red one, and I am going to make the two others. One trick that works for me is that if you are are a room with a ceiling (spelling?) light, put a torch underneath his chin, then the brightest spots will be on the top of his head nose – where the light would be if the ceiling light was shining on his head. A piece of trivia: whenever I went too far (and saw the white back of his head) I would throw him in shock. One again, this is so fun! Look at youtube for the answers and how to make/fold the dragon. search words as dragon 3d..
i let my pupils make over 25 dragons we had fun looking at them, really scared 25 dragons looking and folowing u around the classroom. Love it.It seems like it’s really complicated like there’s some kind of machine behind it or it’s magic when you don’t know the secret,but when you do,you find out that it’s a simple mind trick. lol, there is something like this in a local restaurant. there is a painting of a pirouge. the painting follows you. Amazing. Our brains are really weird. I feel bad for all those people who are blind and miss out on all these awesome optical illusions. We take optical illusions for granted. HAH HAHA enjoyed it dude…nw trying myself.. I printed one from the other website, thats more cooler than this one. i am printing this one out! I think it’s cool!! I don’t care what ‘stuckey’ says! great illusion still confusing how it works. may be will understand if I try to create it. any way thanks for sharing this. It’s really cool, he’s on my bedroom shelf! PS, misspelled “sure” as “shure”. The dragon illusion was created by Magician Jerry Andrus who specialized in tricks based on unusual perception. it will work when ur far in real not on the video. The video still work in near but in real if u get near it will not work. Meh. works WAY better on camera than in person. Spent 20 mins carefully cutting and taping. I can get it to work, if I squint and close one eye, but I’ll lose it sometimes when turning. Also, you have to start at it and visualize convex for a few seconds before you can turn it…and you have to start at the perfect angle. You really have to concentrate to have it keep following you. Still haven’t got it to follow vertical yet. This works incredibly well…I made one, by printing out the diagram, & then gluing it to a thin piece of cardboard…I then cut out the dragon, folded it, & watched, as it came to life….Amazing! I just made one, i told my mom to come see what i made, she was astounded, she didn’t get it at all, then i flipped it around and she was still confused, lol, gonna have to make one for my niece. I AM YOUR SPIRIT!!!! SHOW ME THE KEY TO YOUR BODY!! MWAHAHAHAHAHAAHAHAHHAHAHAHHAHAHAHHAHAHAHHAA!!!! im not kidding, give me the key to your life or i will make a boy with no head or legs to come into your room at midnight and kill you! As Peter Grynch (above) states the illusion was developed by Jerry Andrus who was an an American from Oregon state. Jerry came up with many optical illusions that can be found in science centers around the world. Check out a memorial website devoted to Jerry http://jerryandrus.org/ to see some of the amazing items he discovered, invented and or perfected. He will be missed by many. i made one once and they are cool. This actually answered the downside, thanks! those things always kinda creep me out…its bad enough when actual people stare at you, now art is doing it too! its incredible how can a piece of paper, overpass a computer fx at many ways, with just. These do work very well. You do NOT have to close one eye to see the effect, but it is best viewed from at least 6 feet or 2 meters away. Personally I find that putting them just above head height and stepping back about 6 feet and then blinking a couple of times is the easiest way to make them come into effect. If you find they don’t work, you have probably folded the head wrong. awww this is gr8. i can see it by closing on eye. The best and easy way to see it following you is…….. just switch on your mobile phone camera. This was on an episode of Brain Games on Nat Geo. It is a brilliant thing! I had one of these sitting on my monitor for years. Lost the little guy when my parrot attacked it.